Currently, we work on the following topics to integrate digital technologies with spaces, things, and social fabrics of urban and suburban communities, aiming at addressing their social and environmental problems. In this thread of research, we develop pervasive computing environments for supporting richer ecologies of participation in ‘hybrid’ digital-physical communities based on participatory design. 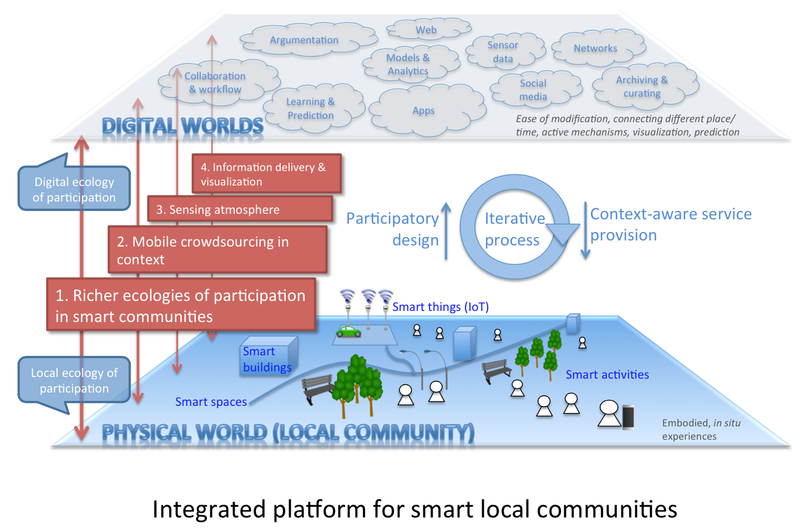 In this thread of research, we develop mobile crowdsourcing apps for local communities based on context-aware computing, community-based processes, and social awareness. In this thread of research, we are exploring novel methods to sense the atmospheres of POPS.